Offer reading recommendations, programming and displays about race and equality and share messages of solidarity at your library. To start, visit our compilation of recommended reading lists on race and equality for all ages and reading levels. Join the conversation on social media by posting images and comments using the hashtags #LibrariesRespond and #HowWeHeal. Visit ALA’s Programming Librarian website for a list of sample tweets or create a short video addressing why racial healing is important to you. Convene a book discussion focused on themes of race, identity and healing. Download ready-to-use discussion questions for books including Ta-Nehisi Coates’ “Between the World and Me” and Elizabeth Acevedo’s “the Poet X,” available for free through ALA’s Great Stories Club. Print and post a sign at your library or your home to show your support. Visit the National Day of Racial Healing website or the #LibrariesRespond website for more ideas and ways to participate. 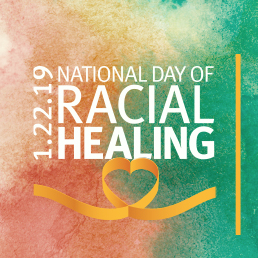 Conceived in 2016 through a collaborative effort of more than 550 U.S. leaders, the National Day of Racial Healing is a time to reinforce and honor our common humanity while celebrating the district differences that make our communities vibrant; acknowledge the deep racial divisions that exist in America and must be overcome and healed; and commit to engaging people from all racial and ethnic groups in genuine efforts to increase understanding, communication, caring and respect for one another. The celebration is a part of the Kellogg Foundation’s Truth, Racial Healing & Transformation (TRHT) effort, a national and community-based process to plan for and bring about transformational and sustainable change and to address the historic and contemporary effects of racism. ALA is one of 100 voluntary National Partner Organizations in the Kellogg Foundation’s TRHT efforts, along with 44 scholars, that participated in the 2016 TRHT design phase. More information is online at http://healourcommunities.org/. Recently, ALA announced 70 libraries that will participate in the TRHT Great Stories Club, a reading and discussion program that will engage underserved teens through literature and racial healing work. The selected books encourage participants to look beneath the surface of racism in America to see how the past is alive in the present, and explore the power of young people taking a stand against racism and other injustices to make the world a better place. The program is supported from a grant from the Kellogg Foundation. The American Library Association is the oldest and largest library association in the world, with approximately 57,000 members in academic, public, school, government and special libraries. The mission of the American Library Association is to provide leadership for the development, promotion and improvement of library and information services and the profession of librarianship in order to enhance learning and ensure access to information for all.